ZAMBIA’S boxing heroine, Catherine Phiri, took time off her busy training scheduled ahead of the World Boxing Council (WBC) title fight to donate assorted food items worth K1,000 to the Mothers’ Shelter at the University Teaching Hospital (UTH). The donation that was done by Oriental Quarries Boxing Promotions (OQBP) and Superior Milling on Wednesday saw the mothers benefitting assorted items ranging from 10x25kg breakfast mealie-meal bags, 5x5kgs rice and 10x5kgs Maize grits. OQBP operations manager Christopher Malunga said the stable will deduct an undisclosed fee from Catherine and Charles Manyuchi purse money to contribute towards the painting of the Mothers’ Shelter building, while Superior Milling managing director Peter Cottan pledged to make similar donations monthly until the end of the year. Malunga said the stable decided to share the foodstuff it was receiving from Superior Milling, meant for the boxers in camp ahead of the WBC title fights on March 15, because the items were more than enough. Catherine takes on Pia Mazelanik of Germany in the WBC women’s bantamweight inter-continental title bout while Manyuchi will fight former Africa Boxing Union (ABU) champion Patrick Allotey from Ghana for the WBC welterweight inter-continental title. “As you know Superior Milling have been feeding the boxers until we hold the WBC title fights but we feel they have given us too much and that is why we decided to share with those we felt can do with the food stuffs,” Malunga said. 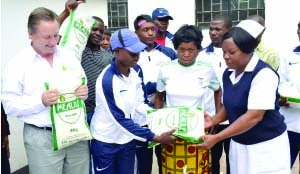 Cottan said as a social responsibility, his company had this year, decided to be giving the UTH Mothers’ Shelter assorted foodstuff on a monthly basis worth K1,000. UTH customer relations officer Natalie Mashikolo commended OQBP and Superior Milling for the donation. “We depend on companies and community for support. I am happy that this programme will not just end here but is a continuous project. Our mothers spend months here and can barely sustain themselves. The perishable products like mealie meal and rice will help a great deal,” she said. Beatrice Chishimba, from Kasama who spoke on behalf of the mothers, said the donation will go a long in easing the challenges faced in buying food. Meanwhile, OQBP coach Mike ‘Weaver’ Zulu has declared Catherine and Manyuchi ready for their respective WBC title fights. Zulu said preparing for the WBC title will not in any way disturb Catherine’s performance at school as the stable has together with the school authorities come up with a special programme to enable her catch up in all subjects after the title fight. And Catherine said she is not in any way under pressure ahead of the fight because she has had enough time to prepare for the fight adding that even the change of date will not in any way disturb her game plan.